Sign up for your certification training today. Contact our GreenTech representative at 855-GTH-BUGS (855-484-2847) . Get Certified! We wrote the book. Dr. Michael Linford literally wrote the book on bed bug heat treatments: The Bed Bug Heat Treatment Field Guide (185 pages). Dr. Linford helped pioneer the research in the late 1980s on the application of heat specifically on insects and the thermal death points of living organisms. The GreenTech Certification program strictly follows the methods of Dr. Linford's research for the Bed Bug Heat Treatment Field Guide. 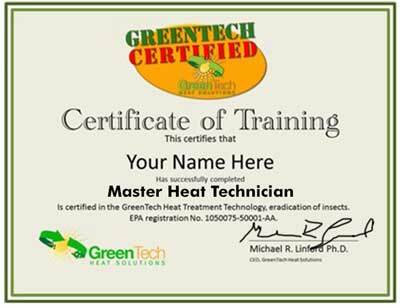 The GreenTech Master Heat Technician Certification program is an enhanced educational program designed for technicians that desire to increase their knowledge and obtain certification in the science and methodology of pest control through the use of heat. Most commonly applied to Bed Bugs but also including eradication of other insects, bacteria, viruses and off gassing of odors, this is a total heat treatment technician certification program. Treatments for bed bugs, cockroaches, stored food pests, clothes moths, wood boring insects, carpet beetles in cabinets, furniture and structures. And many more special applications of heat. Online is convenient and comprehensive so you can work at your own pace. 1. Online convenient and comprehensive so you can work at your own pace. Master Heat Technician Certification $899. If you purchase any Heat Treatment Equipment Package $1999 or more, the certification program is included. You will be sent a Heat Treatment Field Guide, Interactive Certification Test documents and access to a private web page for viewing our Certification series presented by Dr. Michael Linford. GreenTech Certification is an Interactive program including case studies. In addition, many other specialized video discussions on specific applications for the advance technician will be available for viewing. Once completed, you will take a test that will be reviewed by our technical team and any areas that need further discussion for better understanding will be reviewed with the certification student to guarantee a certification. 2. Live personal instruction with our Technical Services Professionals. Live at our National Training Facility in Anaheim, CA. $499 per person. Travel to our specially designed Bed Bug training facility and get live, hands on instruction with the heaters and equipment you will work with in the field. Our training facility is designed to demonstrate different heat treatment situations with either electric or propane. All steps are covered using heat treatment package equipment. Once completed you will take your certification test and ask all the questions you want for one on one Q&A. The best training is live personal, hands on training. Our field trainer travels to your location to train up to 10 technicians at a real structure that will be the focus of treatments. We will treat an infested unit or structure as part of the training and this will allow you to offset the training expense. Each person will get a Heat Treatment Field Guide and work book. The GreenTech Certification Program is included for each technician attending the live training. The course follows the field guide. 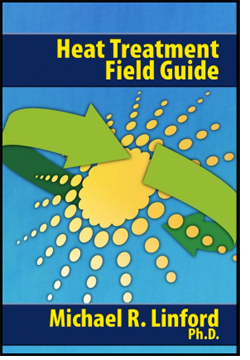 Dr. Linford has designed the Heat Treatment Field Guide and training to be interactive so that learning and acquisition of technical skills is optimized. The most effective way to learn the technology is through tactile (hands-on) training. Training can be achieved for up to 10 people in an on-site training session. We will treat an infested unit or structure as part of the training. The typical time required for scheduling a live training is one day for the GreenTech Technical Services Manager to travel to your location. One full day for training with question and answers. One day travel back for the technical services manager. A single bed bug can become a large infestation if left untreated. One pregnant bed bug can turn into 20 bed bugs after 6 weeks. Those 20 bed bugs will become 100 bed bugs in 12 weeks; the 100 bed bugs will become 425 bed bugs in 16 weeks, and finally, those 425 bed bugs will become an infestation of over 13,000 in just 6 months! Not only do bed bugs multiply rapidly, but they can also live for over a year without food. It is very refreshing to be able to have a discussion on a topic with the person who literally wrote the book on said topic. Thanks for everything you add to our industry; your work and knowledge is appreciated by even those who aren’t aware of it. GreenTech's heat technology has been successfully implemented for over 25 years. This methodology has received an EPA registration status and the Heat Treatment Field Guide technology is the heat treatment label or standard in several states that require this. GreenTech Heat does not offer service. We sell equipment and training for heat treatments of insects. However, we do have a list of the companies we recommend for service that are Certified Services Providers and use GreenTech's products.